AMP is one of the most polemic projects from Google inside the DEV and SEO communities. Every week new information appears with data both in favour and against the project, which in most of the cases shows an incorrect picture about it. Deciding whether to implement AMP or not can have a huge impact for some businesses, so it’s crucial to know what the pros and cons are and if they are completely true. Most of that data is usually flawed, meaningless or half-true, so in this post you will found a compilation of some of the most common assumptions, and what they hide. Important note! This is not an article in favour nor against AMP. It’s just an analysis of some assumptions, both favourable and not so favourable about it. 6 So, should you implement AMP on your website? This specific news piece refers to The Guardian, but you can find similar metrics from other websites. When implementing AMP on your site, Google (on mobile) will replace your normal URLs by your AMP URLs on their SERPs, sending traffic to your AMP pages instead of to your normal pages. So, saying that “The Guardian is getting 60 percent of its Google mobile traffic from AMP”, just means that they implemented AMP correctly and that results are what you would expect, if you knew the % of mobile SEO traffic those pages had before AMP. If you implement AMP on 100% of your pages, those pages will eventually get 100% of Google Mobile traffic, saying nothing about the quality or success of using AMP. It’s just part of the implementation. You could be getting less SEO traffic than before, but having 100% of it landing on AMP pages anyway. The article goes on saying: “AMP has gradually been taking over the Guardian’s mobile traffic; today, 60 percent of its Google mobile traffic is AMP, well above the 10 to 15 percent that publishers have been getting from AMP“. Which is again, meaningless, as the % of traffic AMP pages get from Google mobile depends on your AMP implementation and not from your SEO performance itself. If you search inside forums and blogs, you can find lots of comments about this, stating lots of reasons why the bounce rate of our AMP is so high. Those reasons can indeed be affecting, but the main cause of that high bounce rate is that it is probably wrongly calculated. As I explained here, the way AMP works causes an inflation of sessions and users on your Analytics tool, which then causes an incorrectly calculated high bounce rate. 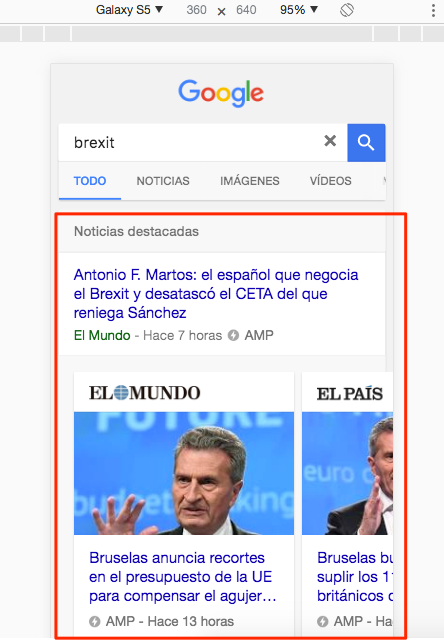 This is a well-known problem by Google, which is tricky to solve, and although they are working on it and have already improved it, the problem still remains for the main use scenario (people reaching your AMP pages through Google search on mobile). So, if you want to analyse the behaviour of your AMP pages, don’t count on the bounce rate metric unless you have implemented any kind of solution to solve it. This box of results is not new, nor created because of AMP. 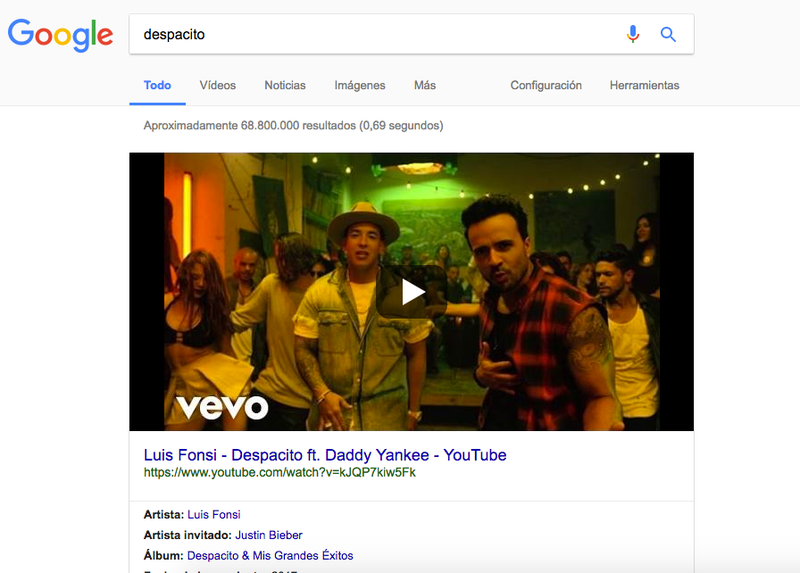 Since Google launched “Universal”, they try to show different types of results depending on the query. That box was initially exclusive for white-listed publishers (you could opt-in if you comply with the requisites), and later on started to show, sometimes, results from websites outside that list (even tweets and youtube videos). With the launch AMP, Google “forced” publishers to adopt its platform in order to appear in that box in mobile. Although sometimes non-AMP results appear there, it’s not the norm. So, when some people say that AMP is a ranking factor because of this box: it’s not. Or at least not a new one, or not because of AMP. The news box existed before AMP, and even if you implement AMP on your pages, your results won’t probably appear there, as most of them are from big publishers. The reason Google uses to justify favouring AMP in the Top Stories box is that “AMP is the format that currently delivers the best possible user experience on the mobile web. That is because AMP allows for consistent speed, caching, pre-rendering, and enables swiping between full-length pages. This is a big deal for topics where there isn’t “that one best result” that a user might want to look at.” (source: Malte Ubl, Creator and Tech Lead of AMP, on HN). You can read my take on this at the end of this post. For the organic, “normal” results, Google says AMP is not a ranking factor yet. Believe it or not, there is no data (at least I couldn’t find it) which demonstrate the opposite. So right now, if you implement AMP on your pages, and you rank 2nd for a query, with your “normal” URL, as soon as Google detects the AMP version of that URL, the AMP result will appear instead, in the same 2nd position. It seems better, but that data is comparing different things. 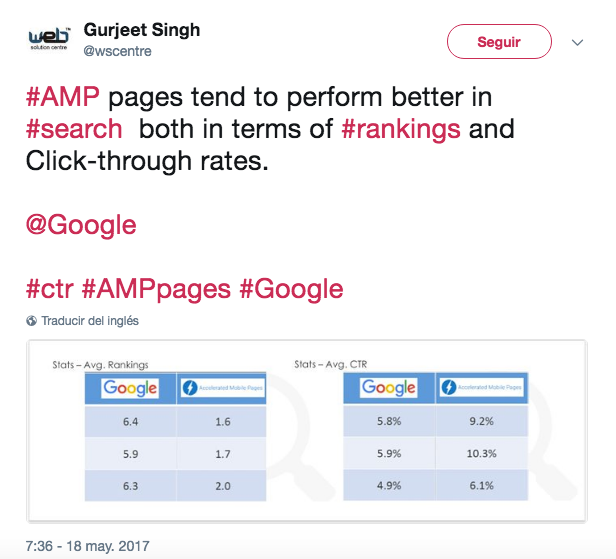 That way, you can see if a keyword for which you have been ranking in the same position for long time, with a stable CTR, gets any improvement right after implementing AMP. Of course there is the possibility that lots of other factors influence this, so you can’t be 100% sure. If you just compare, in Search Console, the performance of your AMP pages with your non-AMP pages, you are probably doing it wrong. These are the stats, from Search Console, for my travel blog RandomTrip.es, both for Mobile AMP pages and Mobile non-AMP pages. So with these stats, AMP Mobile pages win: better CTR (8.82% vs 5.01%) and better average position (7 vs 7.7), right? Well, not exactly. These are not stats about the same pages with different output, they are about different pages (pages that have AMP version always appear with their AMP version on mobile), so the comparison makes no sense. What we are comparing here is different kind of pages (the homepage and categories/tags vs posts), which may have, by themselves, different SEO performance for lots of different reasons. And, it’s not demonstrated with data. It can be true, but it also cannot, so if you want to use it as an argument to implement AMP, you will need to test it yourself or get real data from someone who already tested it. There is data both assuring that CTR improves and also that it decreases, but because of the explanation and examples given in the previous point, none of the assumptions are really demonstrated. This article was one of the first polemic ones that took of in communities like Hacker News against AMP, and it is an interesting read as it reflects how little people know/understand about AMP (even inside the dev community). There are a lot of restrictions regarding CSS, JS and Ads, so they force you to create pages without all the “stuff” that makes your “normal” pages slow and that you are not willing to take out of them. So your AMP pages will (or at least should) be faster than your “normal” mobile pages. Instead of sending the visitors to your AMP pages, Google is actually caching your AMP pages on its servers and serving them itself. This assures some server side optimizations their infrastructure already have. Point 2 is the controversial here: you are no longer serving these pages, Google does, and that’s why it seems Google is stealing your traffic. 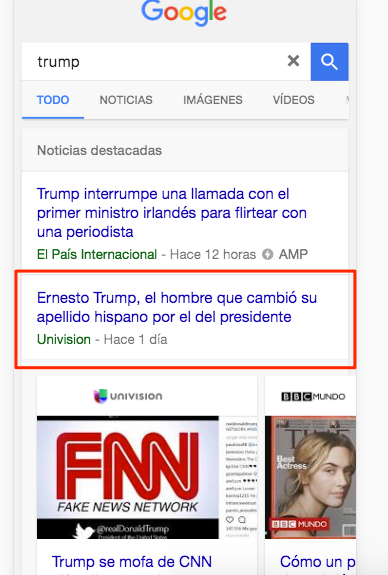 BUT, users don’t completely leave Google when they click on AMP results, they can swipe from one news piece to another between different websites when using the “Top Stories” box, and the URL showed on the user’s browser is a Google one, not yours. So the traffic is counted as yours, but it’s Google serving it, and it’s Google the one controlling the environment in which the users are seeing your content. 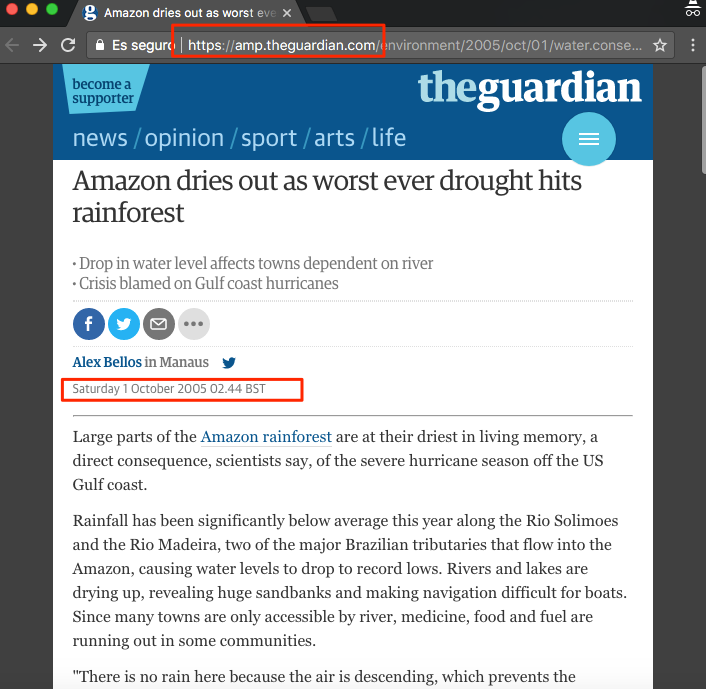 Another complaint the author of the article (Alex Kras) does, is that AMP is not optional for the user. 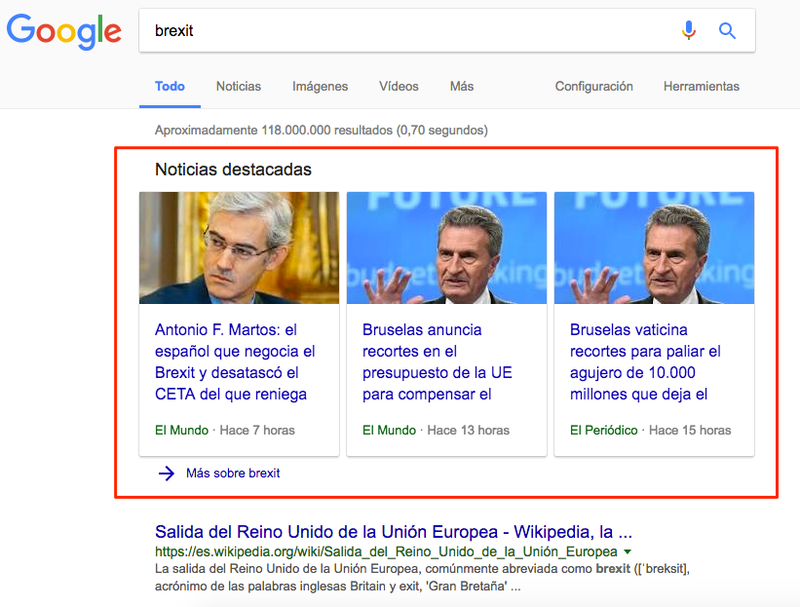 Contrary to what happens with App indexing, where if you have the app from the result’s domain installed and Google know that you can check the content there, it will direct you there, but offers another link to just check the content on the website. So, should you implement AMP on your website? Well, as with every business decision, and as we Galicians always say: it depends! You need to evaluate the pros and cons, and take extra care with the metrics you use to evaluate your decision. 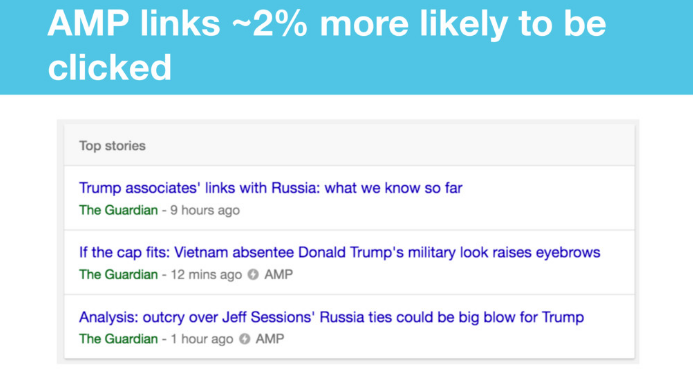 If you rely on Google News traffic, then you probably are already using AMP. If not, you are at disadvantage as most of the results in the “Top Stories” box are AMP ones. Right now it is not demonstrated that using AMP will give you a rank nor a CTR boost, so if your mobile website is fast enough, you can probably live without AMP. If Google starts giving AMP results (because they want to promote the technology or because they give speed more weight in their new mobile index), then you need to take that into account as well. If your mobile website is slow, fix it! Whether you implement AMP or not, speed should be a priority, specially on mobile. My take here is that Google is not trying to fool websites and business with AMP and that the negative aspects of how AMP works right now are more of consequences / limitations of the platform than their goal itself. In general, if you implement AMP on your website you will see your pages loading faster, which is a good thing. Also, the adoption of AMP is bringing to the table some best practices in terms of web performance that you should follow on your own website too, and not only on the AMP version. On the other side, I hope Google stop using its power to make websites to adopt their whole ecosystem. It should be possible to implement AMP without using Google’s cache, getting the “AMP” label anyway. Actually, as probably 99,9% of the users don’t even know what “AMP” means, they should test other kind of labels if they want to highlight “mobile optimized” results, and it should rely on the speed and UX of the destination page, not on AMP. Do you have data to prove any of the assumptions? If so, let me know!